HPQ Silicon Resources Inc is pleased to announce that its 100% own subsidiary, Beauce Gold Fields Inc, will immediately start a geophysics program in order to further delineate the boundaries of the company's recently discovered major fault that rises beneath the historical placer gold deposit, (HPQ Press release May 11, 2017) on BGF 100% owned Beauce Gold Fields property located in the municipality of St-Simon-Les-Mines in the Beauce region of Quebec. The work program will consists of two lines audio-magnetotelluric (AMT) surveys, 2 lines of Electrical resistivity tomography (ERT) surveys and multiple gravimetric surveys, and will be done under the supervision of Professor Marc Richer-LaFlèche, Ph.D. Geo of the INRS. Patrick Levasseur, President and COO of HPQ Silicon stated, "This is an important follow-up to the discovery of the major fault line as this will narrow our search of the hard rock source of the St-Simon-Les-Mines gold placers, and since the equipment and the INRS technical team was already mobilized in the area, we just could not pass on this opportunity and wait until next year to have this important work done." Mr. Levasseur also stated, "Also exciting is the addition of ERT surveys over an unexplored area of the old gold mines along the Giroux creek were some of the largest nuggets were found in the past." Audio-magnetotelluric (AMT) surveys of high vertical penetration will be conducted parallel to the east along Rang 6 road and along Rang Chaussegros road to the west of the previous survey that was carried out along a 5.6 km section along the St-Gustave road. This path crosses perpendicularly the stratigraphy of the Beauceville Formation and its main regional structures. Results will be used to to locate the direction of the major fault identified from the survey conducted on the St-Gustave Road. The survey will also be used to document the presence of conductors that may be associated with massive polymetallic sulphides deposits as suggested in the last survey. Electrical resistivity tomography (ERT) surveys will be made on both sides of the Giroux Creek extending past its confluence at the Gilbert river to end on lot #, on realestate owned by the Company. (southwestern part of the map in Figure 1). This area was mined in the nineteenth and early twentieth century (shafts and tunnels) and two of the largest gold nuggets discovered in the Beauce come from this sector. Geophysical imagery should allow visualization of the geometry of the quaternary units and detect electrically polarizable zones located in the bedrock (sulphide zones). Gravimetric survey: Given the presence of volcaniclastic rocks and graphitic shales (electrically conductive), gravimetry is the best method for detecting the presence of massive sulphides of the Champagne type (VMS, Sedex) in the St-Simon- the mines. Mr. Benoit Violette, P. Geo is the Qualified Person as defined by National Instrument 43-101 that supervised the preparation of the information in this news release. The Company is proceeding with the spinout of its Beauce Gold Fields Inc subsidiary via a listing on the TSX-Venture exchange by way of a court-approved statutory Plan of Arrangement. Legal counsel is finalizing the Plan that will be submitted to the court, once the plan has been pre-approved by the TSX-V. This step is required in order to obtain an interim order from the court of the Plan, so that thereafter the Plan of Arrangement can be subject to the approval of the company's shareholders at a special shareholder meeting to be called for the purpose of seeking such approval. After having received approval of the Plan the Company will petition the court for a definitive approval of the spinout. Only upon reception of the definitive approval by the court can the Board of HPQ elect a date of record, after consultation with the TSX-V.
Further details and updates will be provided to shareholders and other stakeholders via news releases only. Shares For Services Program: In accordance with the agreement between HPQ-Silicon and AGORACOM (see Uragold press release July 18, 2014), extended by both Parties from July 15, 2016 to July 15, 2017 under the same terms and conditions (see HPQ press release September 16, 2016), is extended by both Parties for an additional year, from July 15, 2017 to July 15, 2018 under the same terms and conditions. In accordance with the shares for services agreement between HPQ and AGORACOM on August 10, 2017, HPQ Board approved the issuance of 78,470 common shares at a deemed price of $0.18 per share to pay $14,125 for services rendered during the period from January 16, 2017, ending April 15, 2017. Furthermore, today, HPQ Board has approved the issuance of 113,000 common shares at a deemed price of $0.125 per share to pay $14,125 for services rendered during the period from April 16, 2017, ending July 15, 2017. Beauce Gold Fields Inc (BGF) is a wholly owned subsidiary of HPQ Silicon. HPQ is in the process of "Spinning Out" Beauce Gold Fields into a new publicly trading junior gold company. 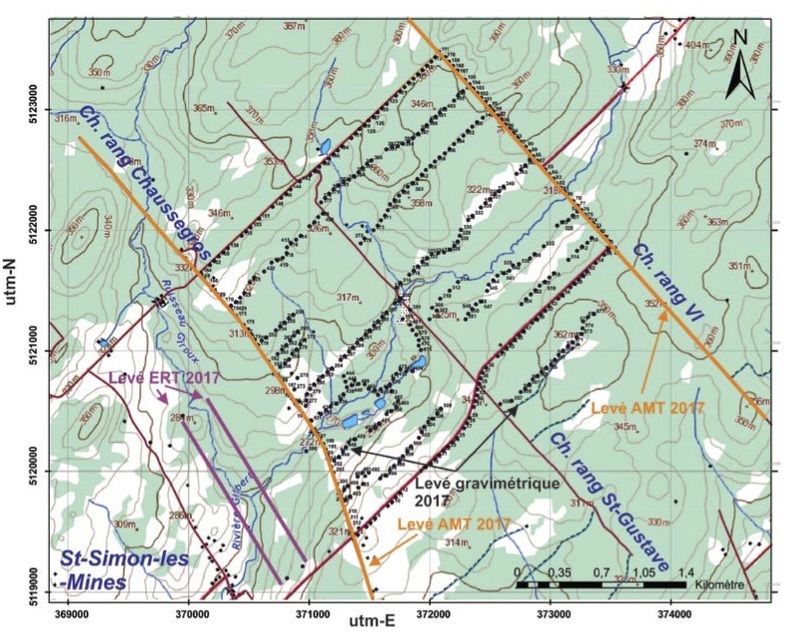 The Beauce Gold Fields project is a unique, historically prolific gold property located in the municipality of Saint-Simon-les-Mines in the Beauce region of Southern Quebec. Comprising of a block of 152 claims 100% owned by HPQ, the project area hosts a six kilometer long unconsolidated gold-bearing sedimentary unit (a lower saprolite and an upper brown diamictite). The gold in saprolite indicates a close proximity to a bedrock source of gold, providing possible further exploration discoveries. The property was also hosts numerous historical gold mines that were active from 1860s to the 1960s.